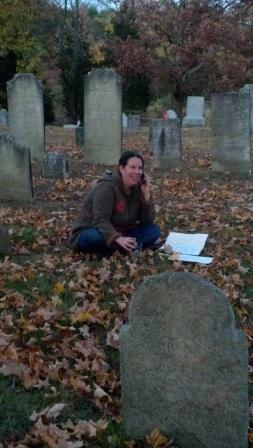 Me, camped out in a haunted cemetery while live on the air for the Bad Apple episode of Scary Scribes, October 22, 2012. We’d been promising an exclusive taste of the first few pages of my novel, Bad Apple, to Scary Scribes listeners for awhile. 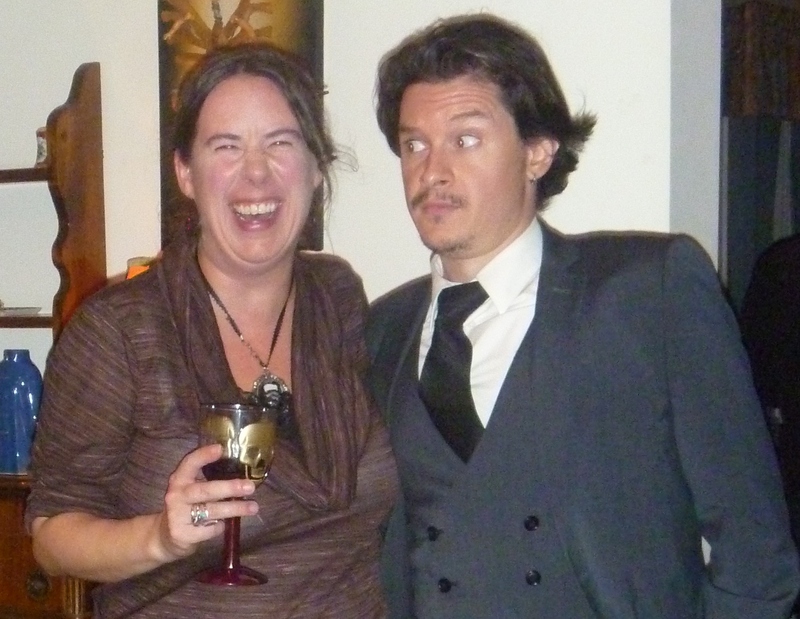 We got to do that on Episode 8: Paranormal Eh? 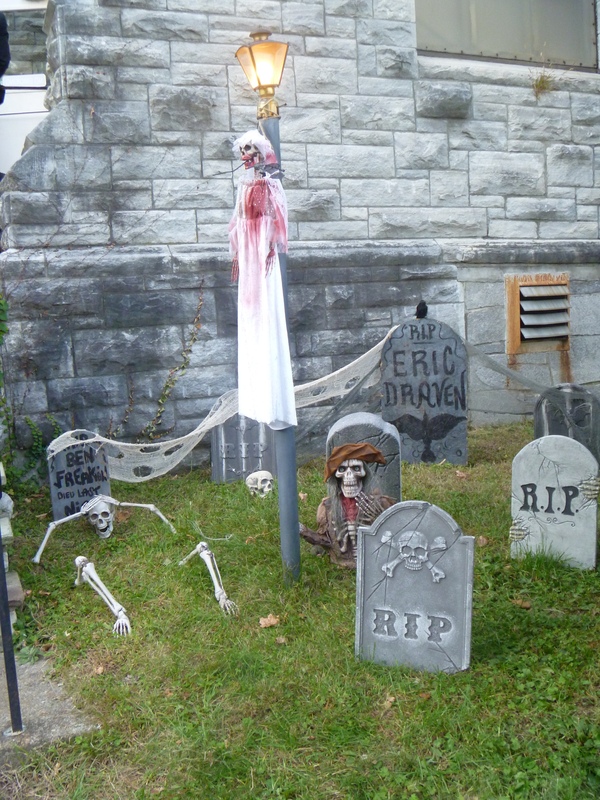 Meets Scary Scribes…from a haunted cemetery. The show went as planned, but after the episode went to archive, downloaders contacted Terry, noting they were hearing static followed by a woman’s voice (a woman’s voice that wasn’t mine). 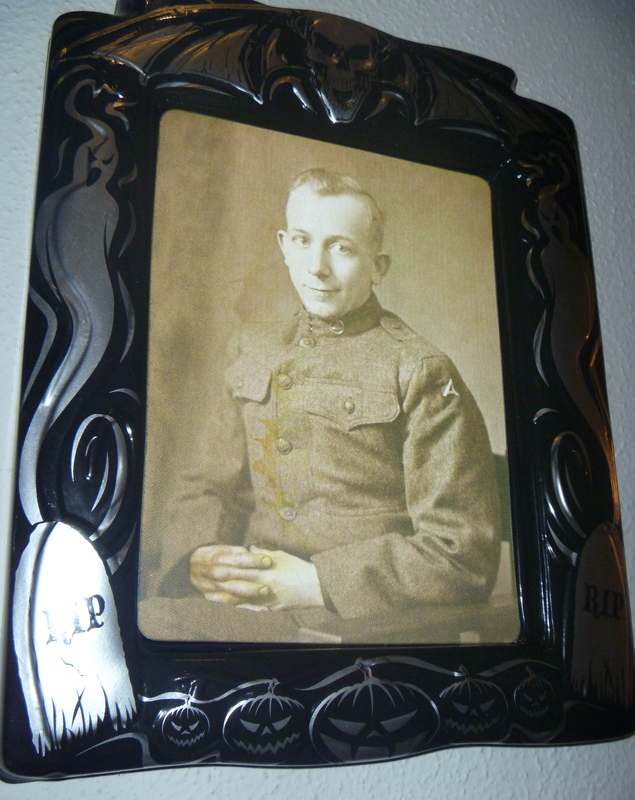 Could this be an EVP [electronic voice phenomena—an unexplained voice, attributed to a ghostly presence, heard on a recording which wasn’t audible when the recording was made]? Or is it simply an errant cell phone transmission? You’ll hear it toward the end of the podcast. 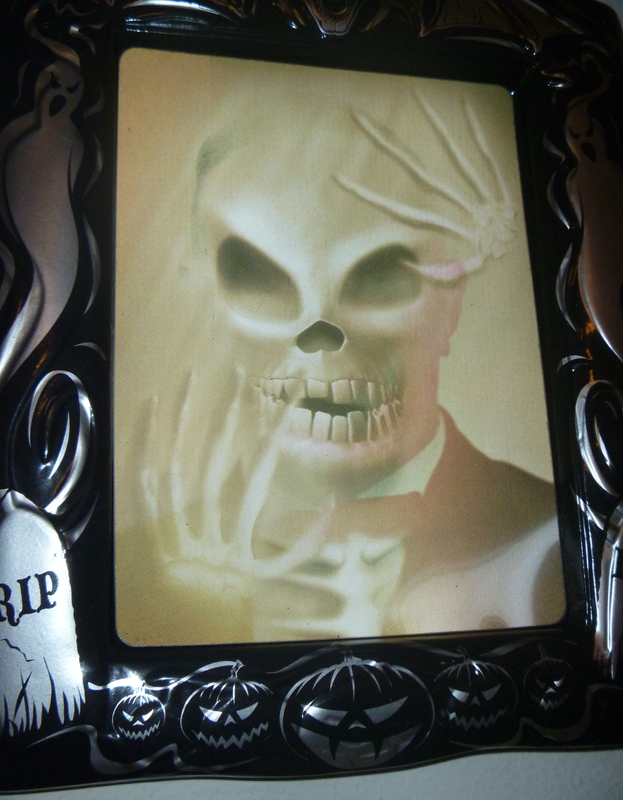 To me, it sounds like it could be the latter, but either way, it’s eerie, so I’m not so sure I’ll be reading in any haunted cemeteries again anytime soon. 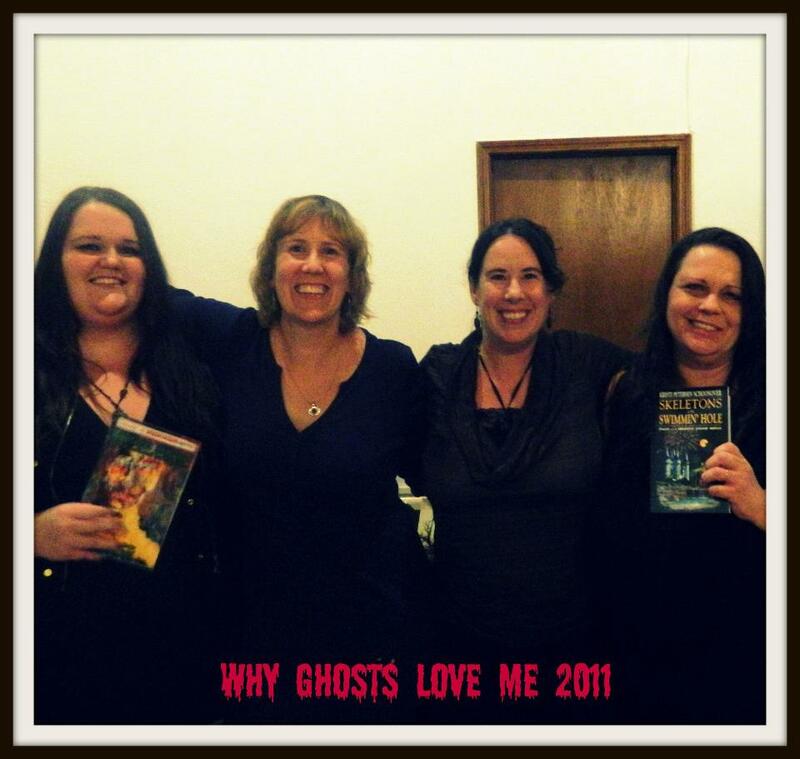 MISS ‘WHY GHOSTS LOVE ME?’ FUNDRAISER? PIX AND VIDS HERE! Thanks to Jennifer Strickler Cole for this fantastic pic! 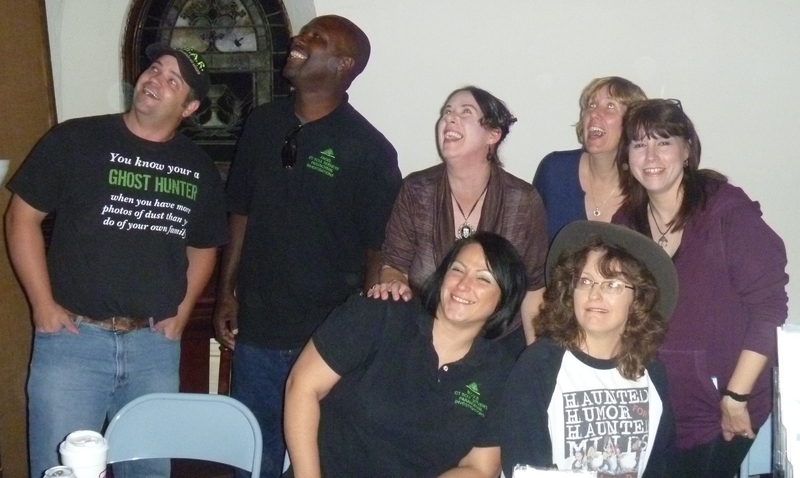 I don't exactly know what they're doing--trying to scare up ghosts?--but here they are, left to right, Frank Todaro of The Invisible World, Terri J Garafolo of Entities-R-Us, Nicole Hall of CT Soul Seekers, Mike Mafara of CPEAR, Nathan Schoonover of various paranormal and TV programs, Angel Ortiz of CT Soul Seekers, and Andy Siedel of Indy Para. 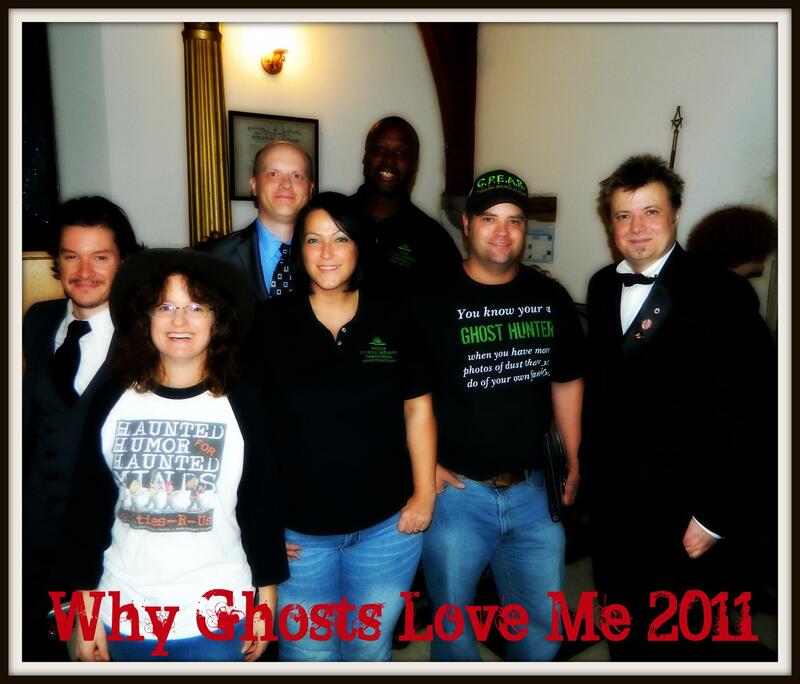 Why Ghosts Love Me at St. Peter’s Masonic Lodge #21 in New Milford, Connecticut was a huge success! If you missed it, here’s photos and video. 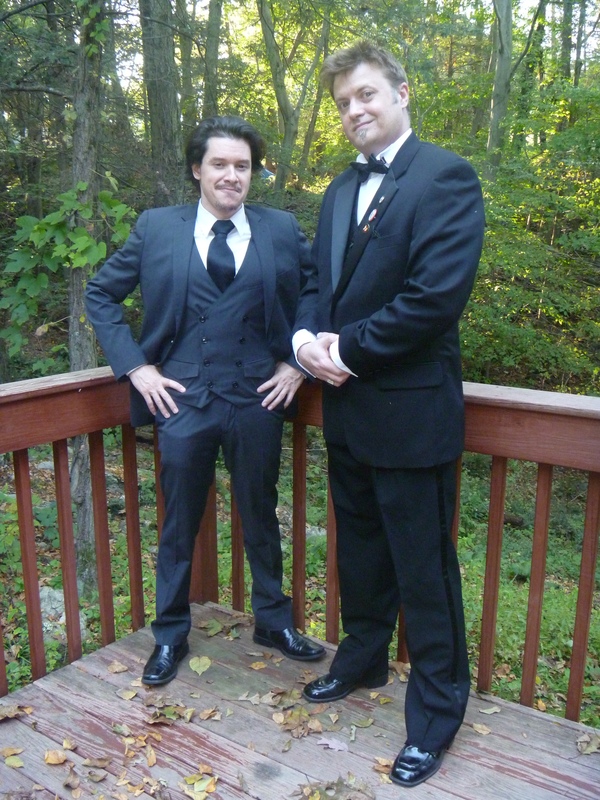 Frank Todaro, of The Invisible World, and Nathan Schoonover are ready to go! 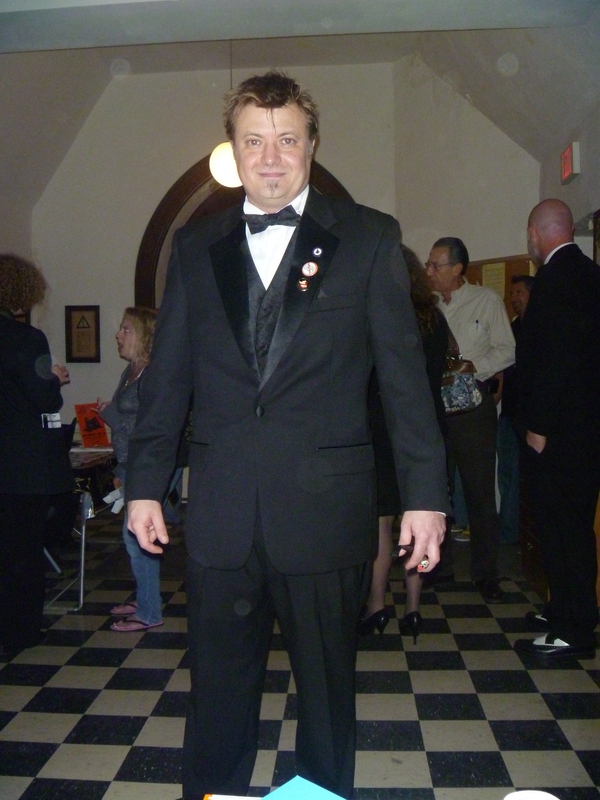 Nathan Schoonover of A&E’s Extreme Paranormal, Travel Channel’s Paranormal Challenge and The Ghostman & Demon Hunter Show was on hand for spooky stories and Halloween fun. 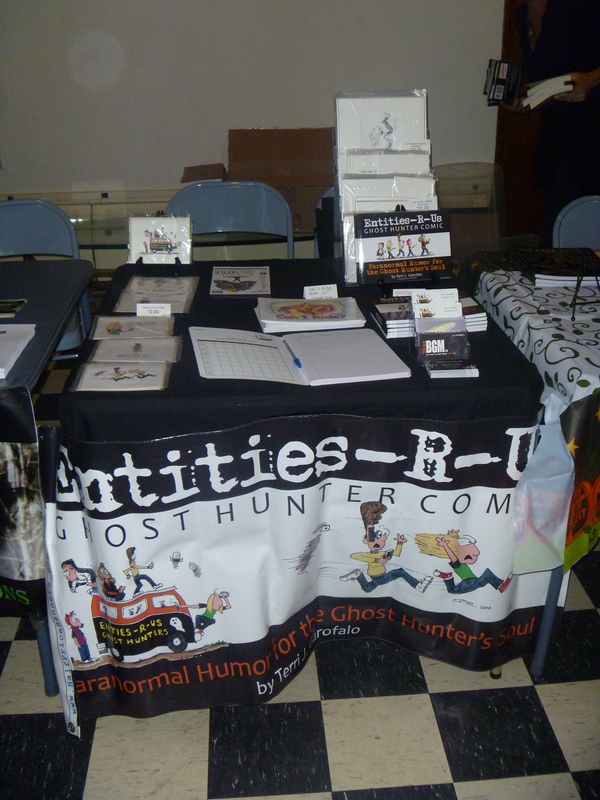 The presentation included ghostly stories and paranormal evidence with guest speakers Nicole Hall and Angel Ortiz of Connecticut Soul Seekers, Terri J Garofalo of Entities-R-Us—ghost hunting comics—Donna Parish-Bischoff of Indy Paranormal and Frank Todaro of The Invisible World Radio. 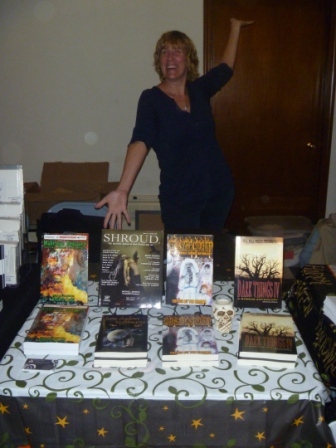 I was there signing copies of my book, Skeletons in the Swimmin’ Hole—Tales from Haunted Disney World, and was joined by fellow horror short fiction writer Stacey Longo, also of New England Horror Writers Association. 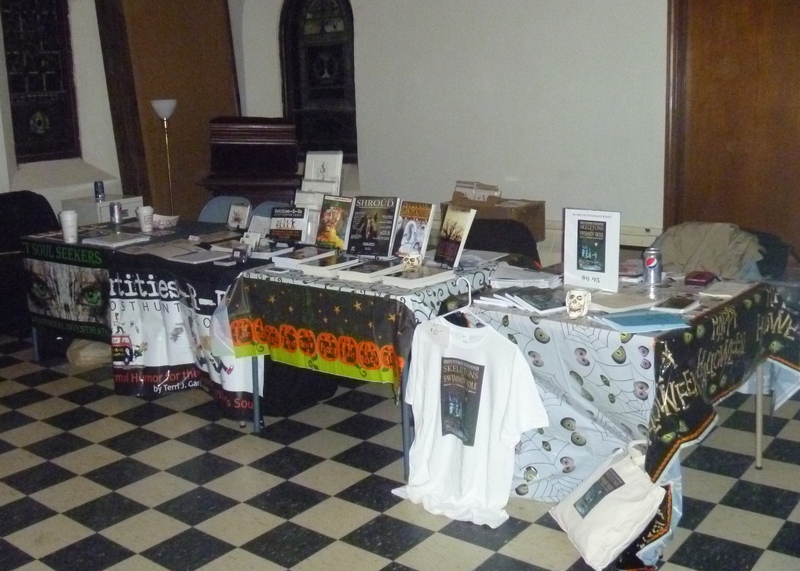 Proceeds from all sales and admission went toward the upkeep of the historical St. Peter’s Lodge. 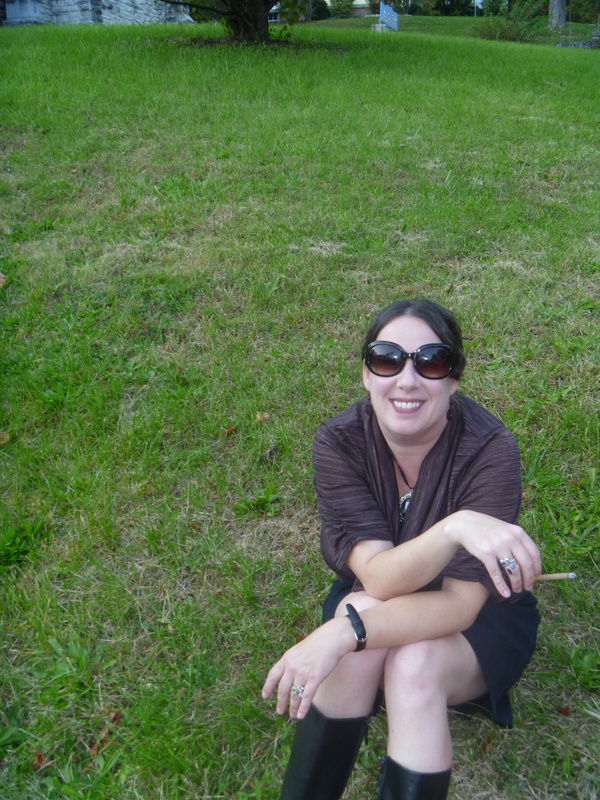 Me, taking a break on the lawn of the Lodge before heading inside to set up. Photo by Maureen McFarlane. 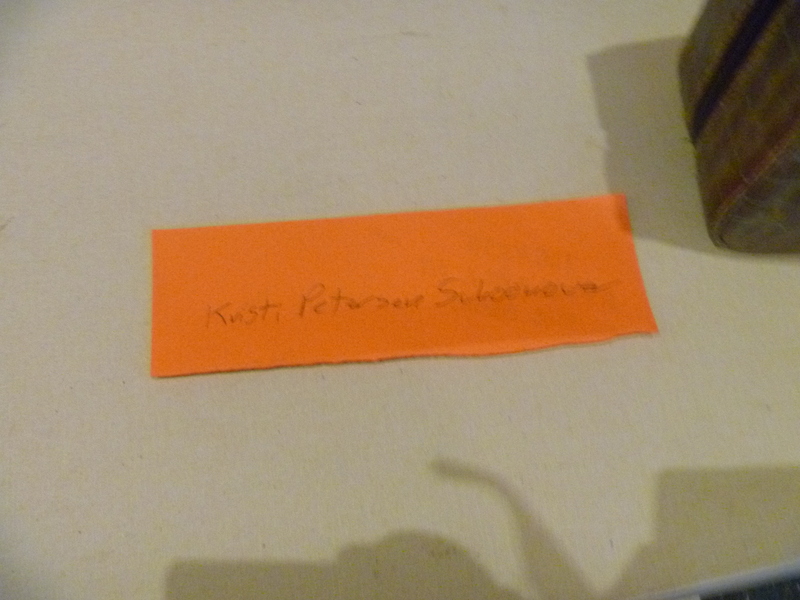 Yeah, this is my Krissi-a-Go-Go look. Photo by Maureen McFarlane. The entrance to the lodge. 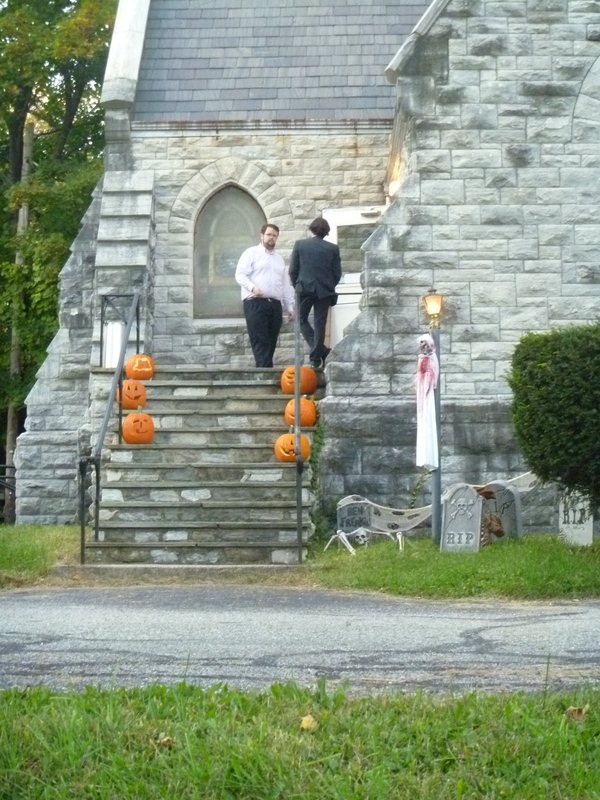 The Masons did a great job decorating the outside! 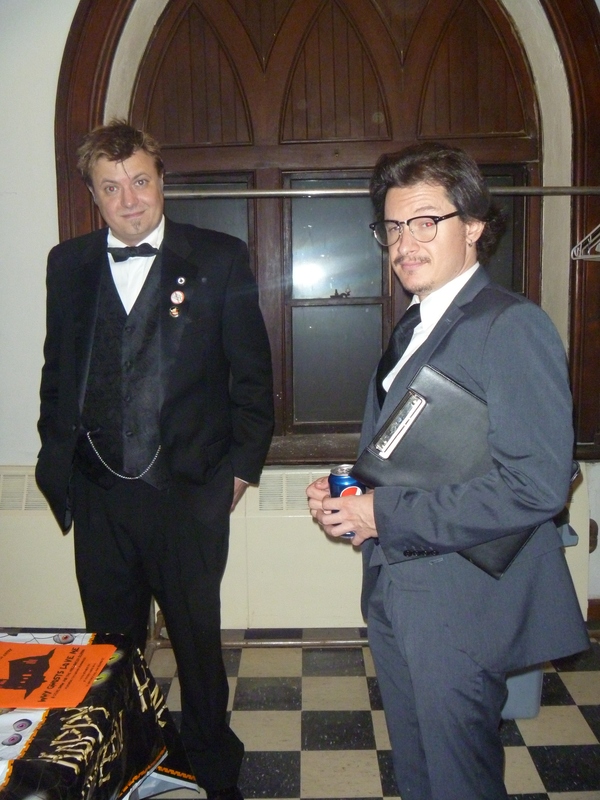 Carl Keyser, of the lodge, is facing the camera; he also did the event’s flyer. 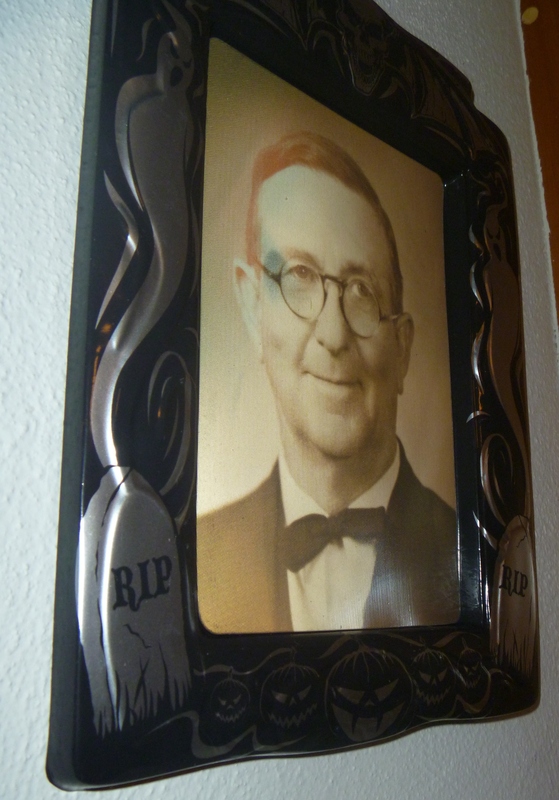 Billy Mo Buckbee, longtime friend and member of the Lodge, created this cemetery to the right of the stairs. Nathan had tables for presenters on reserve. 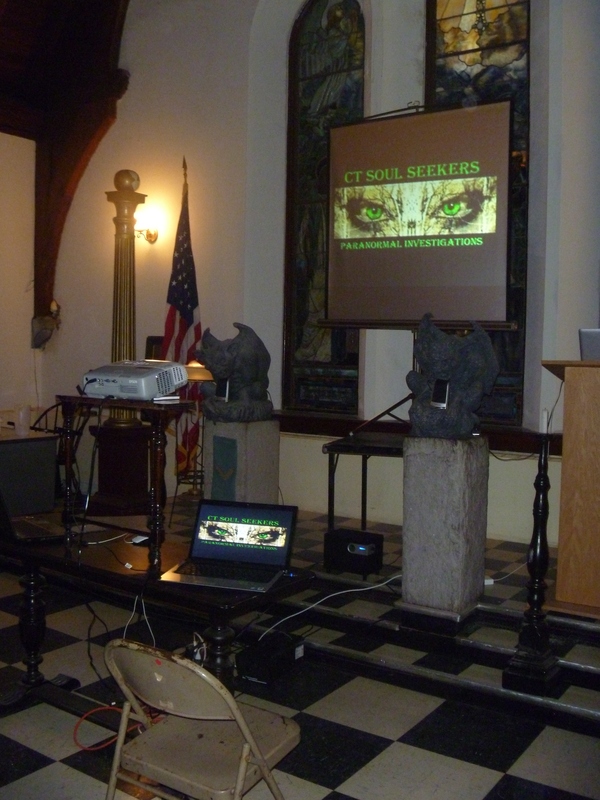 The alcove where presenters set up their tables. 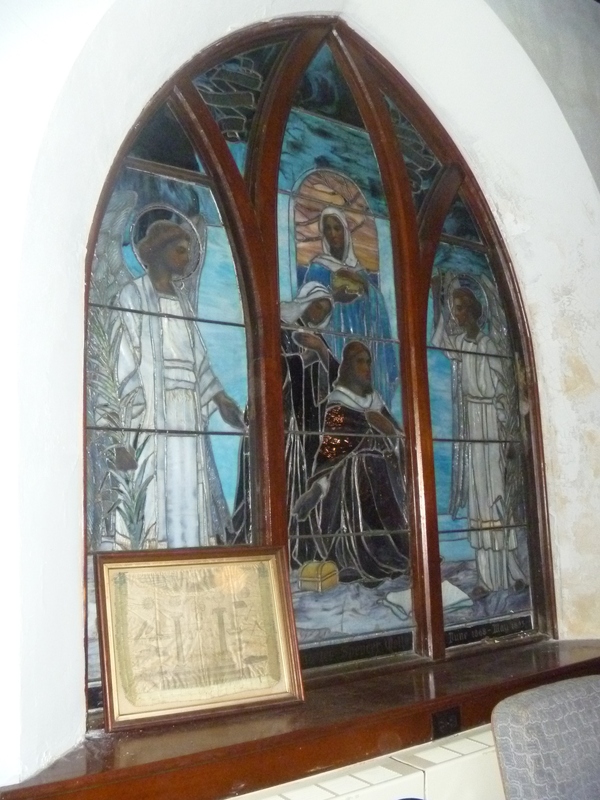 The stained glass windows are just so gorgeous; at last year’s event, this area was cordoned off. 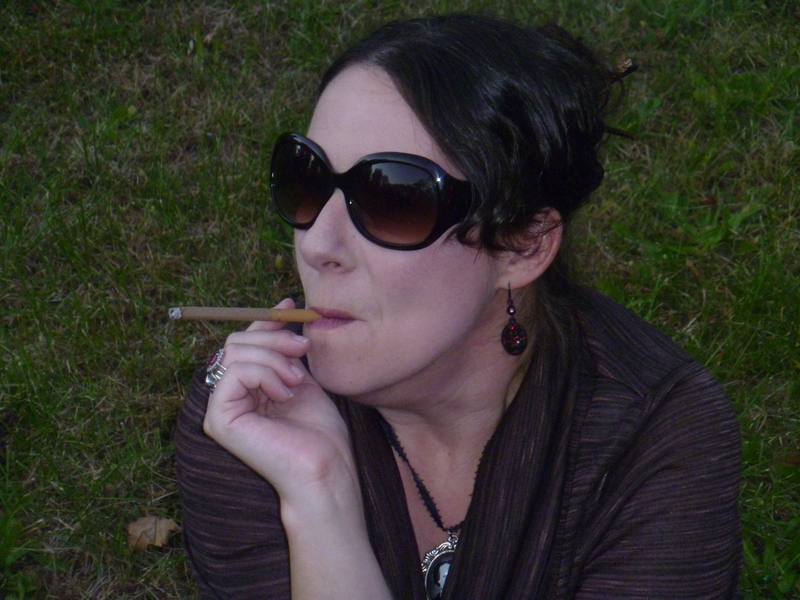 Stacey Longo, short fiction horror writer, also of New England Horror Writers. 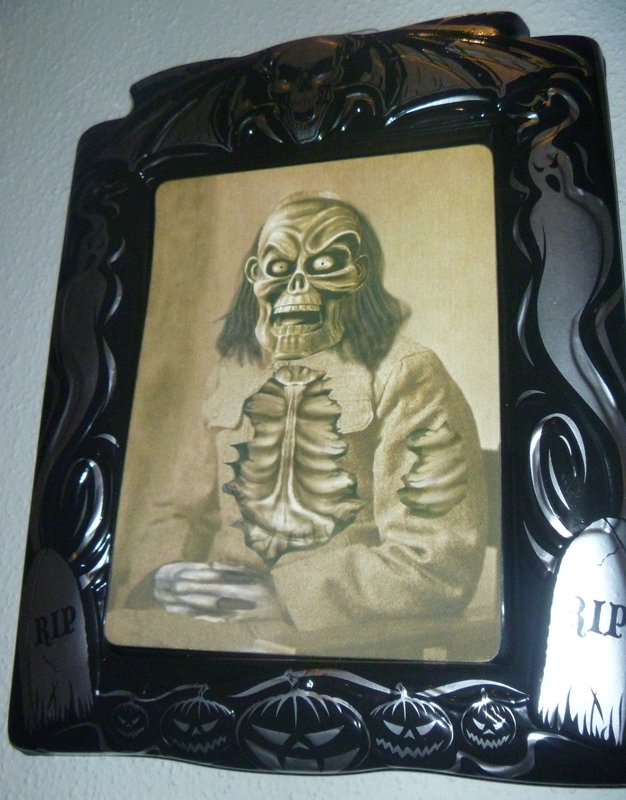 A close-up of the Skeletons in the Swimmin' Hole Table. 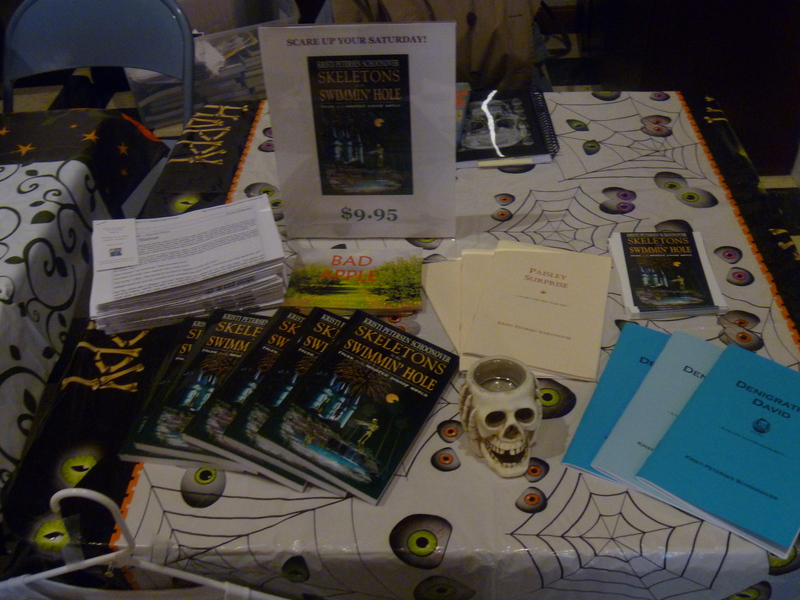 A full shot of the Skeletons in the Swimmin' Hole--Tales from Haunted Disney World table. 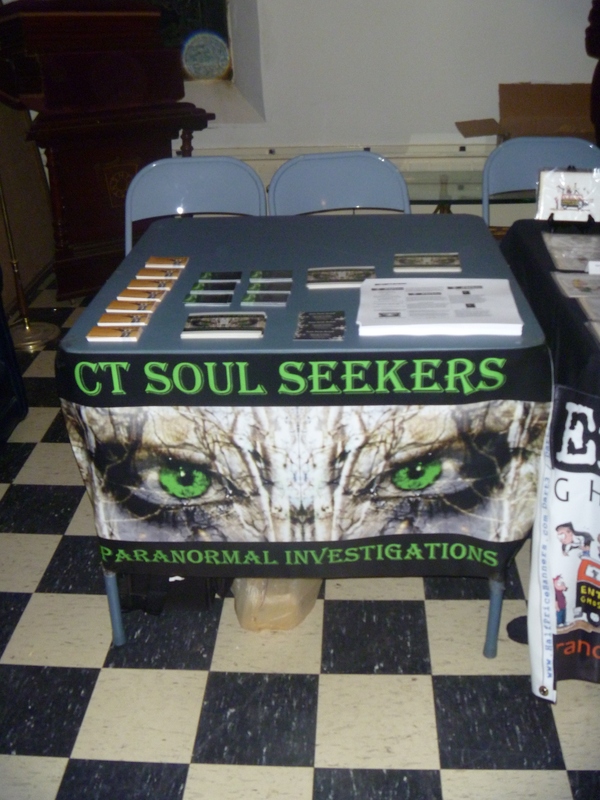 Connecticut Soul Seekers' table. 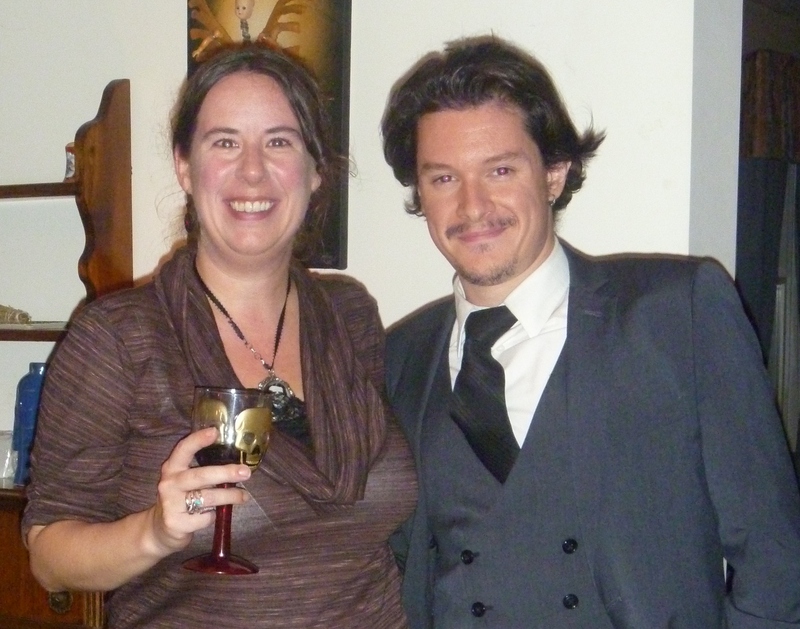 Nicole Hall, who also writes the Our Haunted Lives column for the Canadian group Paranormal, Eh? 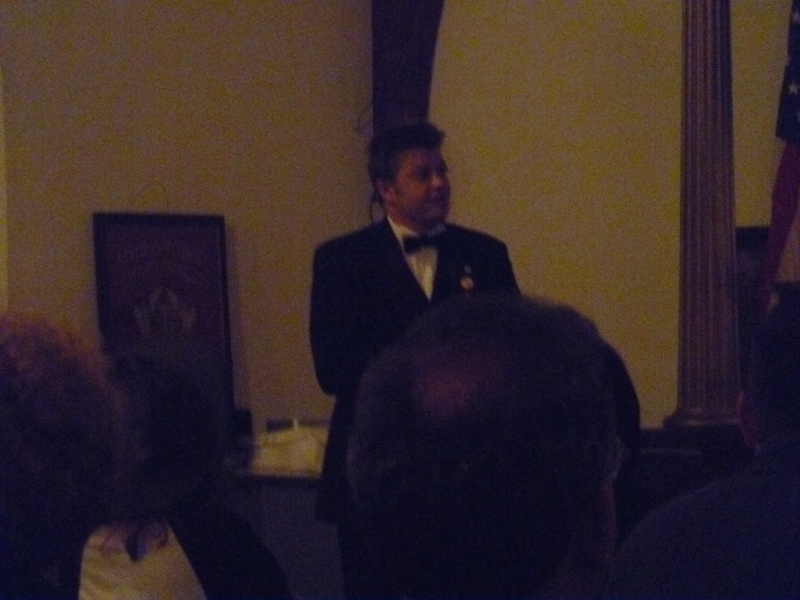 and Angel Ortiz did a great presentation. 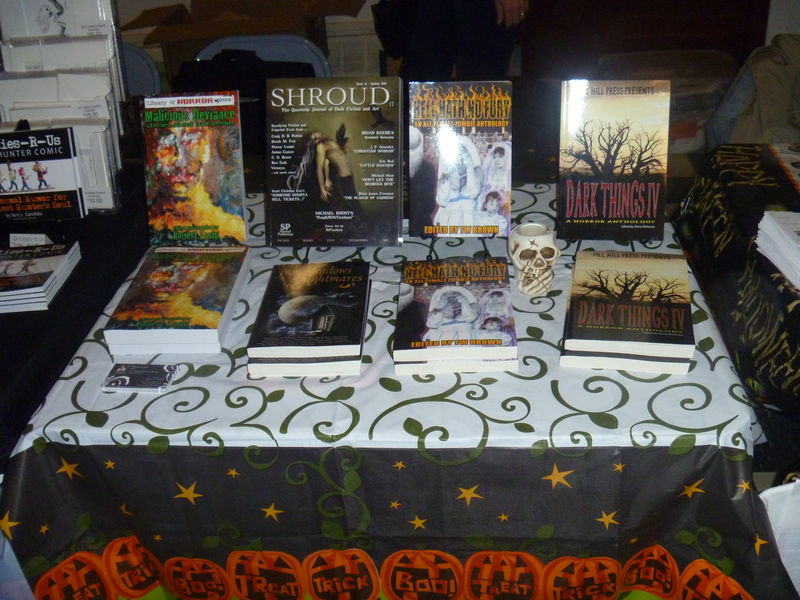 Terri J Garofalo's table. 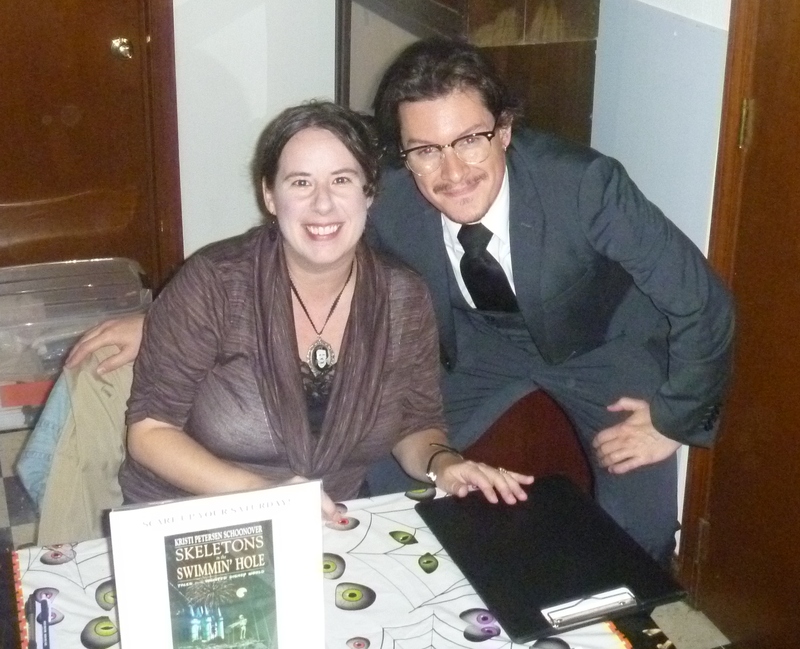 She writes terrific ghost hunting comics. Thanks to Jennifer Strickler Cole for this fantastic pic! And no, they are so not ready to present yet! 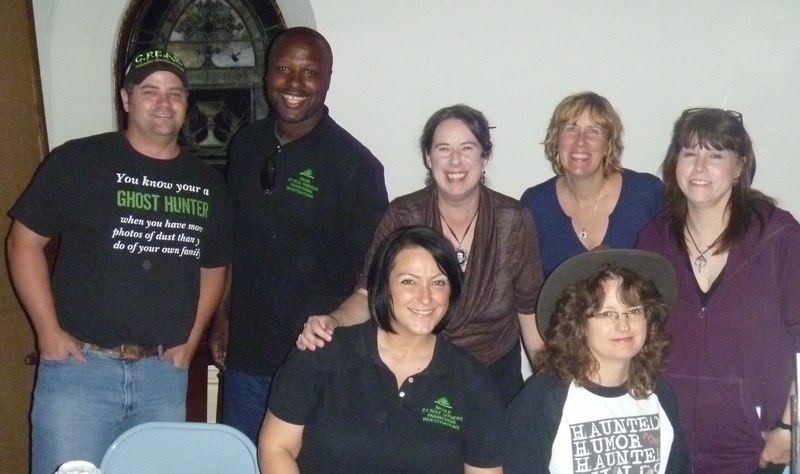 Here they are, left to right, Frank Todaro of The Invisible World, Terri J Garafolo of Entities-R-Us, Nicole Hall of CT Soul Seekers, Mike Mafara of CPEAR, Nathan Schoonover of various paranormal and TV programs, Angel Ortiz of CT Soul Seekers, and Andy Siedel of Indy Para. Connecticut Soul Seekers gets ready to take the stage. 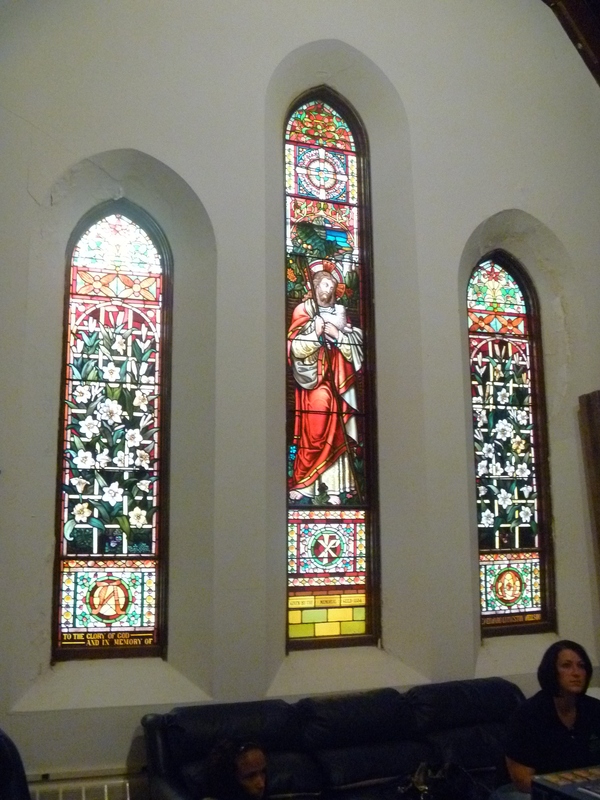 A close-up of one of the windows in the Masonic Lodge's main hall. 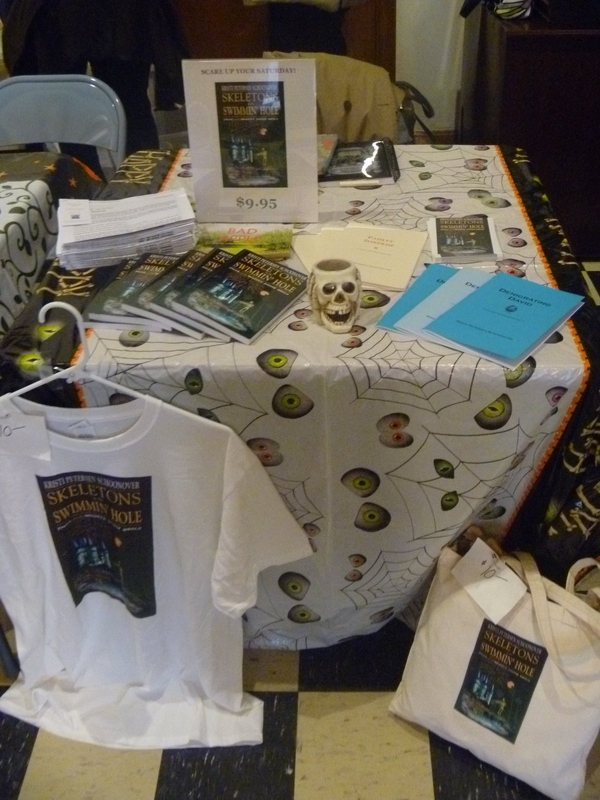 Stacey Longo’s table. 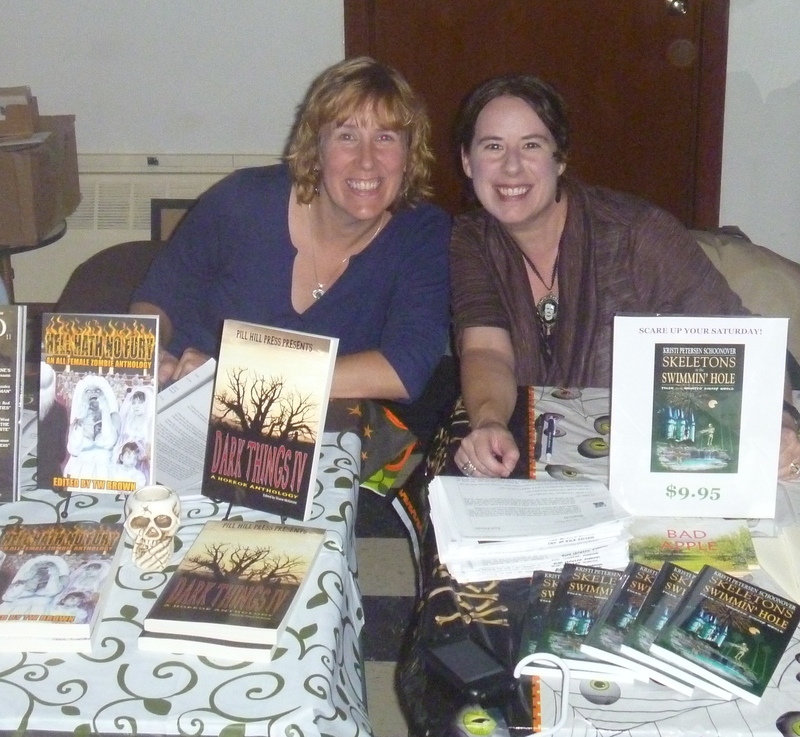 Stacey and I are both members of New England Horror Writers.Stacey has written many scary short stories and has been featured in numerous anthologies. 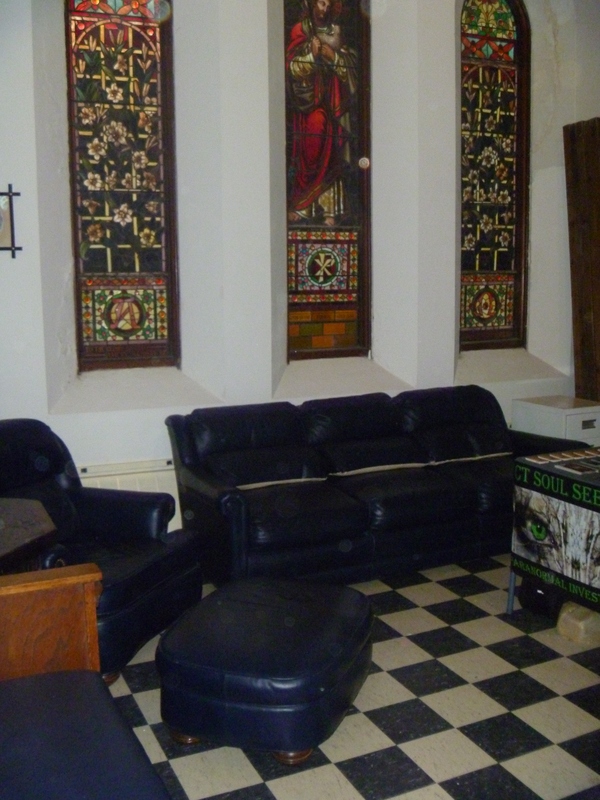 The foyer of the Masonic Lodge. The couches were especially comfortable. 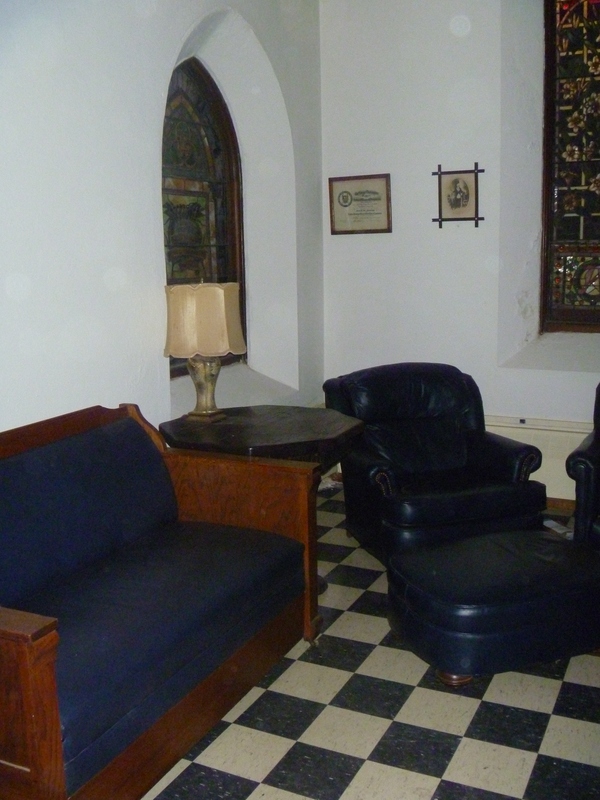 The foyer of the Masonic Lodge. 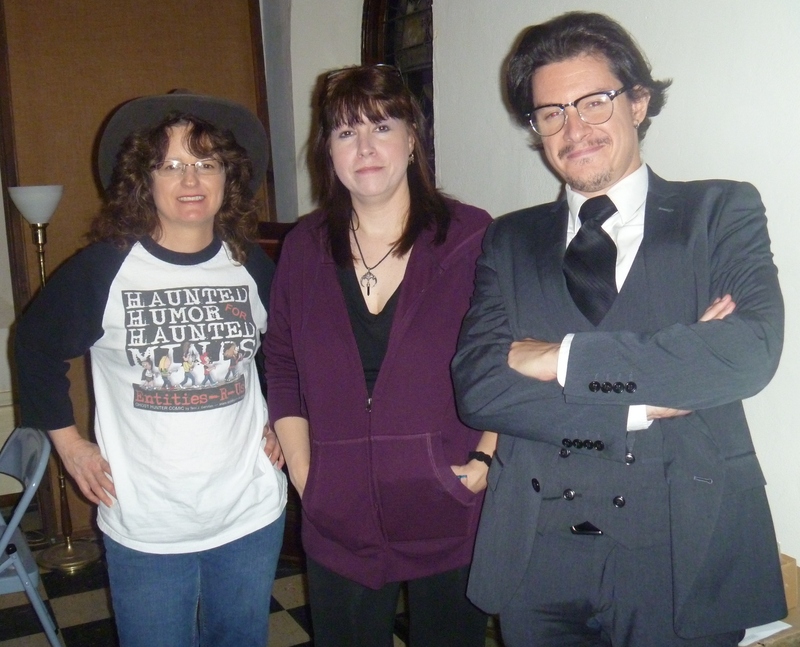 Terri J Garofalo of Entities-R-Us, Donna Parish-Bischoff of Indy Para, and Frank Todaro of The Invisible World. Dinner of champions! 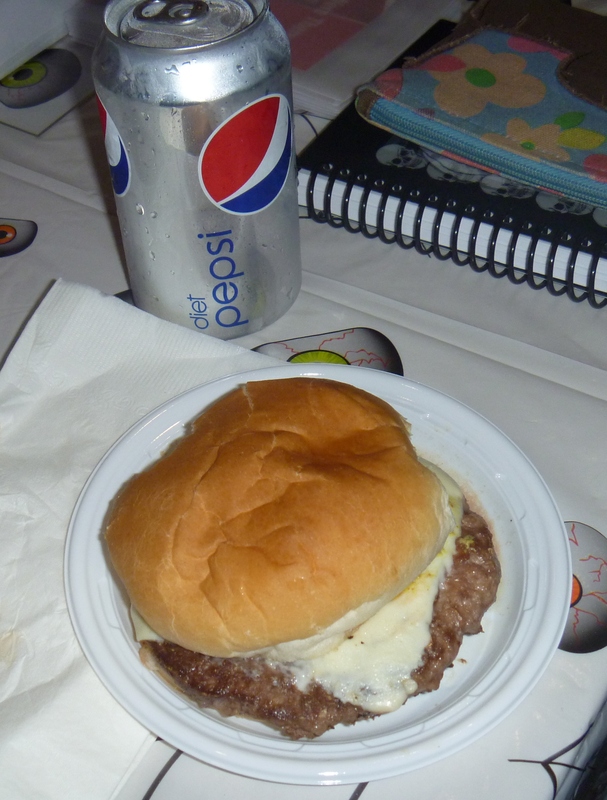 Seriously, they have good food available at these events. That burger was delicious. Just rare enough to be juicy. 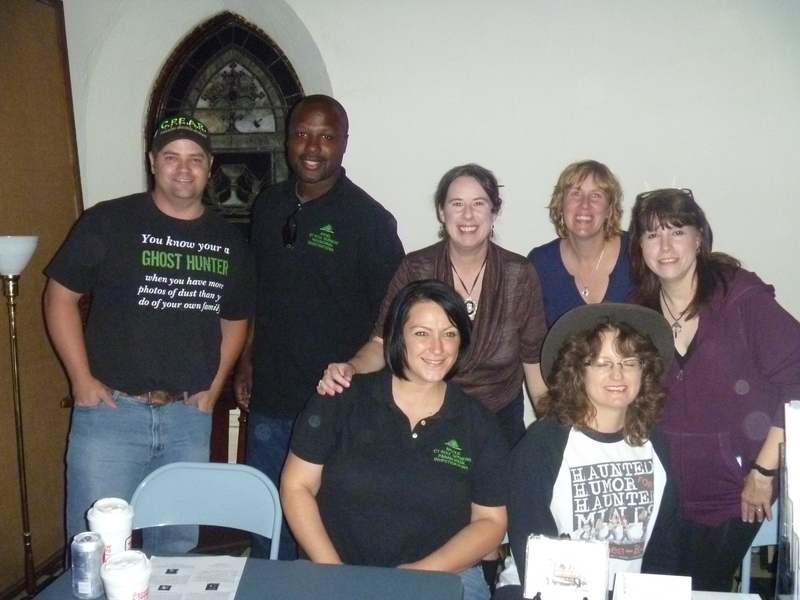 Left to right, Mike Mafara of CPEAR, Angel of CT Soul Seekers, me, writer Stacey Longo, Donna Parish-Bischoff of Indy Para, Nicole of CT Soul Seekers, and paranormal humorist Terri J. Garofalo. OH MY GOD THERE'S AN ORB!!! Nathan just before the presentation. Left to right, Billy Mo Buckbee and Nathan. 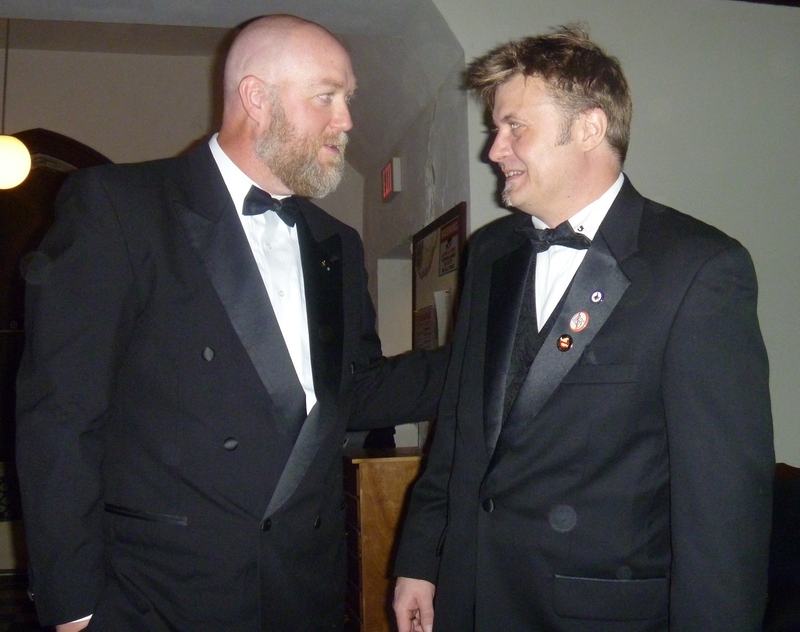 Both are members of the Masonic Lodge. 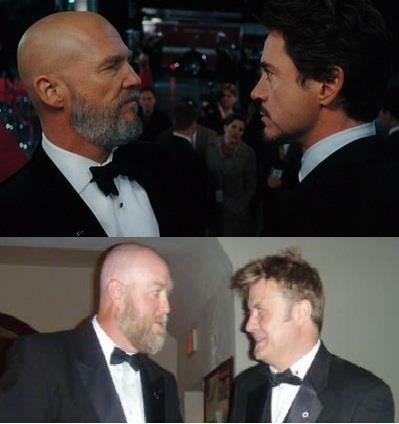 You know, clowning around… Billy and Nathan or Obadiah Stane and Tony Stark? You just gotta love a changing portrait! What was cracking us up about these portraits was that Nathan said they took down a couple of portraits of lodge members and put these there instead. Nathan and Frank just before the presentation started. Taking a break outside. 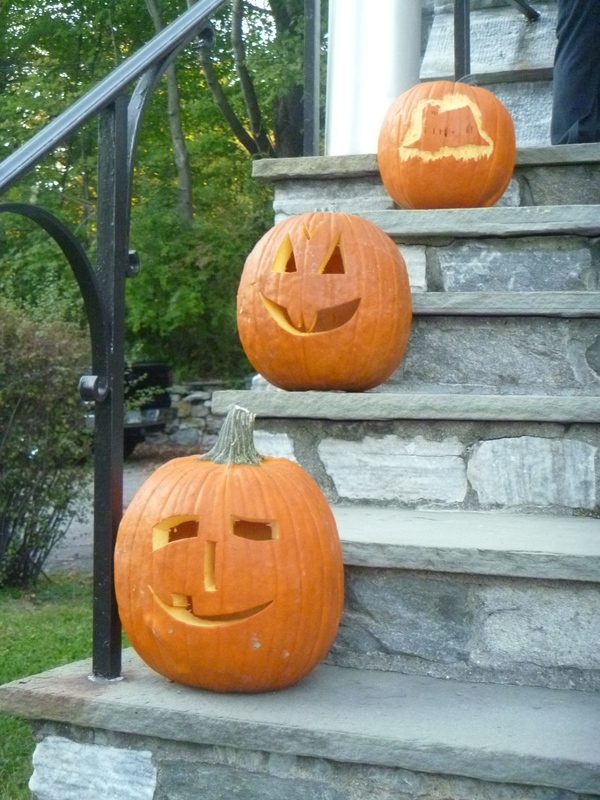 The jack o'lanterns were a great touch...and kept Sam away, of course (points if you know what I’m talking about). 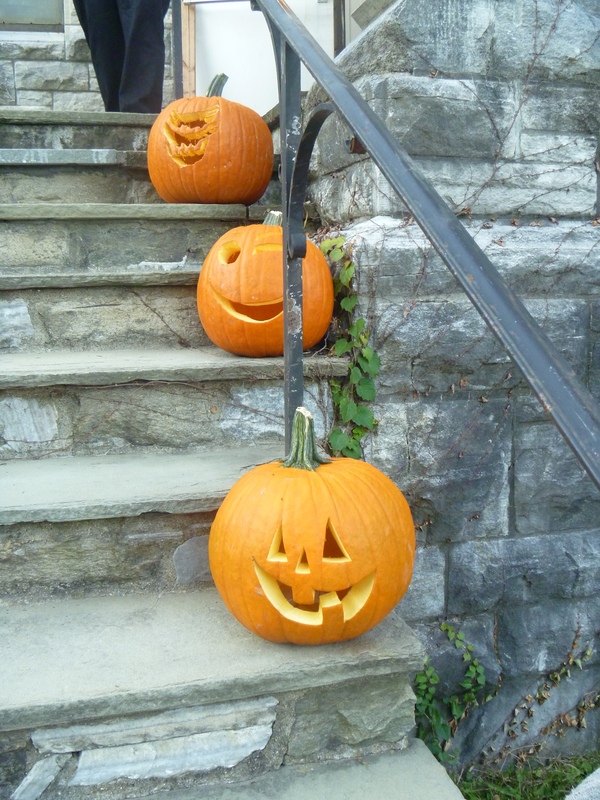 They were carved by Lodge members Carl Keyser and Billy Mo Buckbee. Thanks to Jennifer Strickler Cole for this fantastic pic! It looks like they’re finally ready to begin! 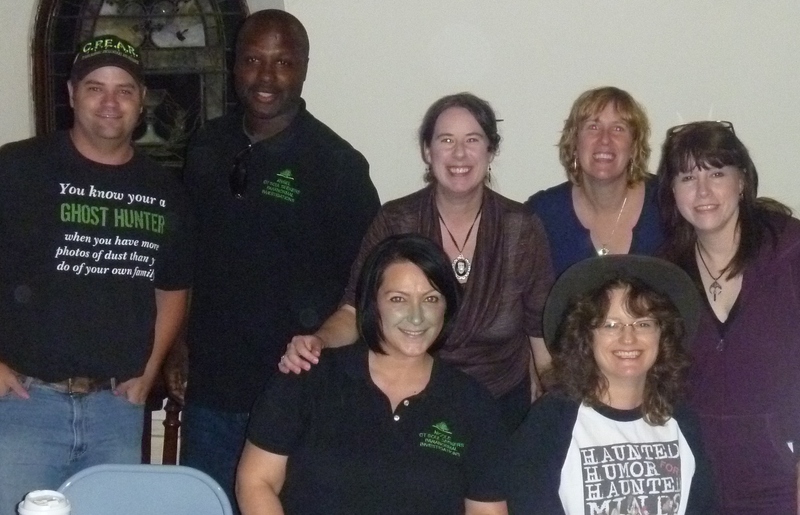 Here they are, left to right, Frank Todaro of The Invisible World, Terri J Garafolo of Entities-R-Us, Nicole Hall of CT Soul Seekers, Mike Mafara of CPEAR, Nathan Schoonover of various paranormal and TV programs, Angel Ortiz of CT Soul Seekers, and Andy Siedel of Indy Para. 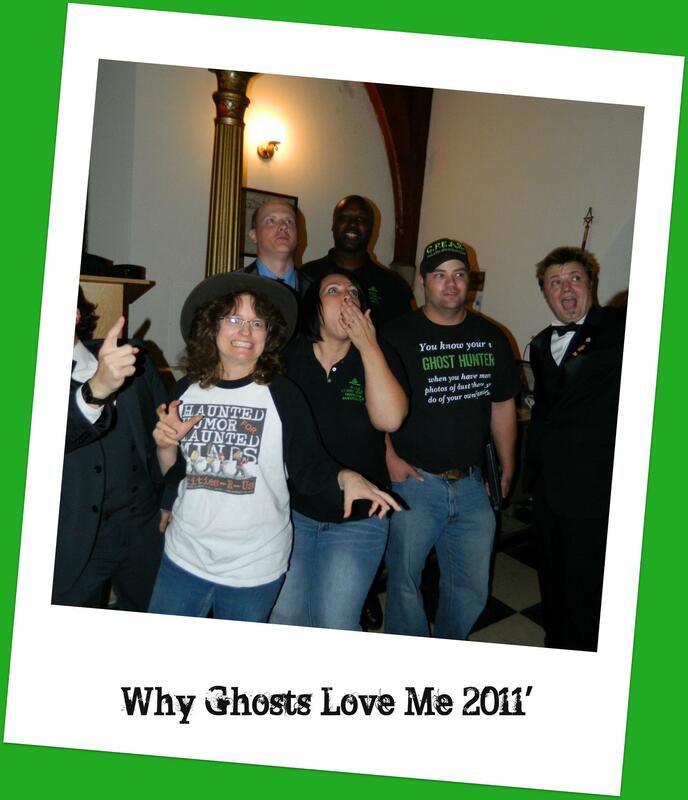 The opening moments of Why Ghosts Love Me. 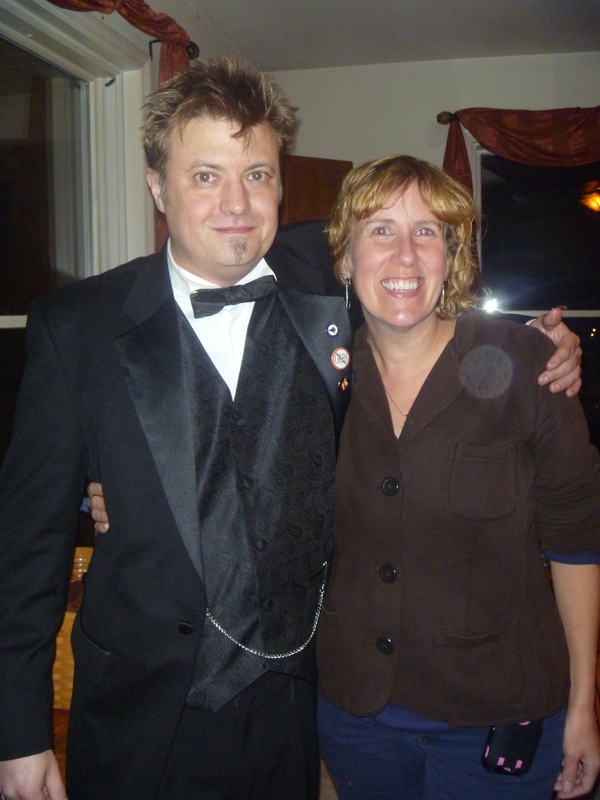 Jennifer Strickler Cole, of Goshen, and Stacey. 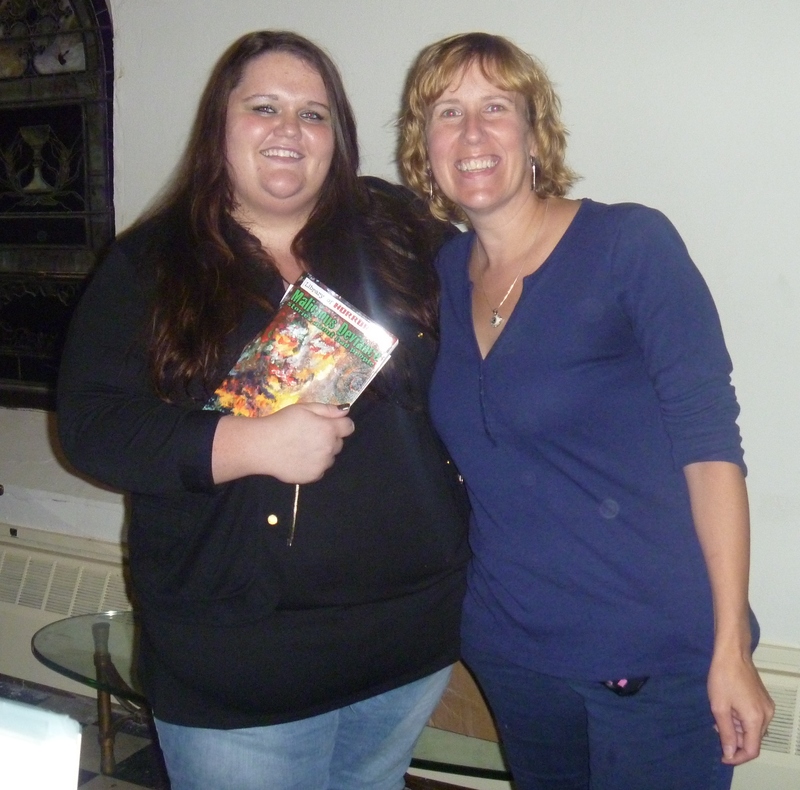 Jennifer picked up the anthology HELL HATH NO FURY, which features one of Stacey's stories, for her spooky Halloween read. From left, Jennifer Strickler Cole, Stacey Longo Harris, me, and Jayne Mackel, also of Goshen, who picked up Skeletons in the Swimmin' Hole for a friend. Thank you JENNIFER STRICKLER COLE for this great shot! Left to right, Jennifer, Stacey Longo Harris, Kristi Petersen Schoonover, and Jayne Mackel. 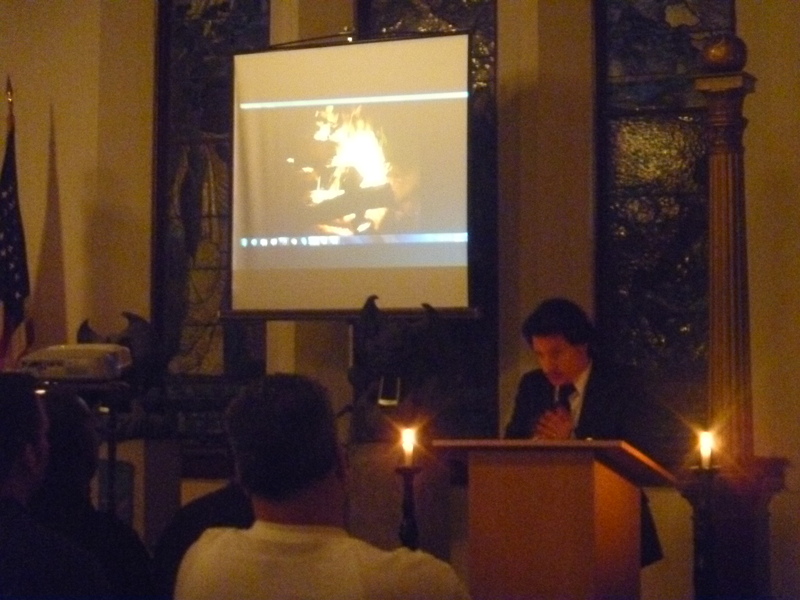 Frank Todaro delivers his "Campfire Stories," which is a popular segment of his show, The Invisible World. 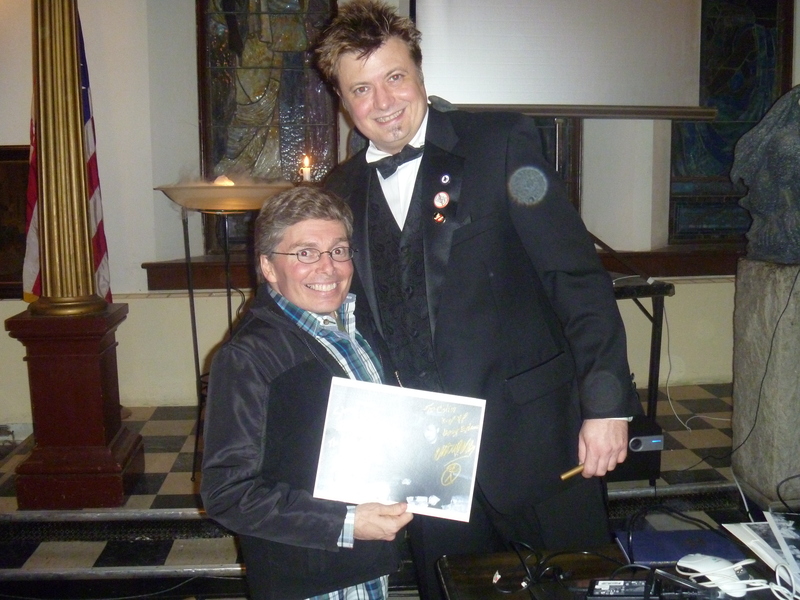 Frank Todaro shares a tale from his very popular “Campfire Stories” on his radio show The Invisible World. Nathan gives his opinion on a Campfire Story. 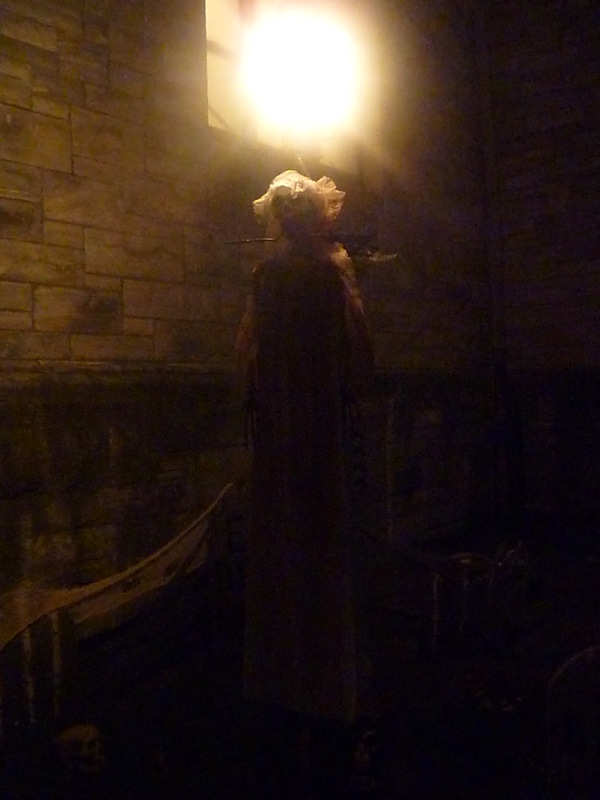 This is the ghostly bride Billy hung from a lamppost. It reminded me of Miss Havisham. 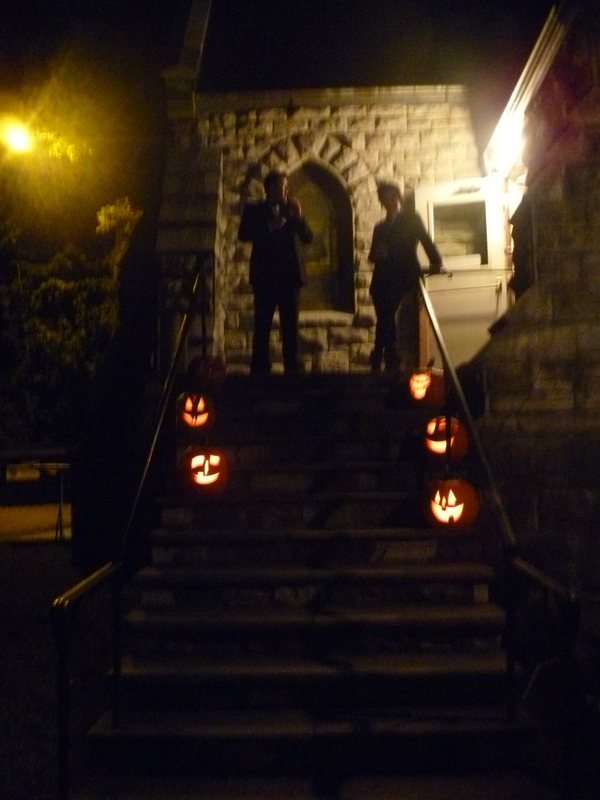 The St. Peter's Lodge silhouette on one of the pumpkins. 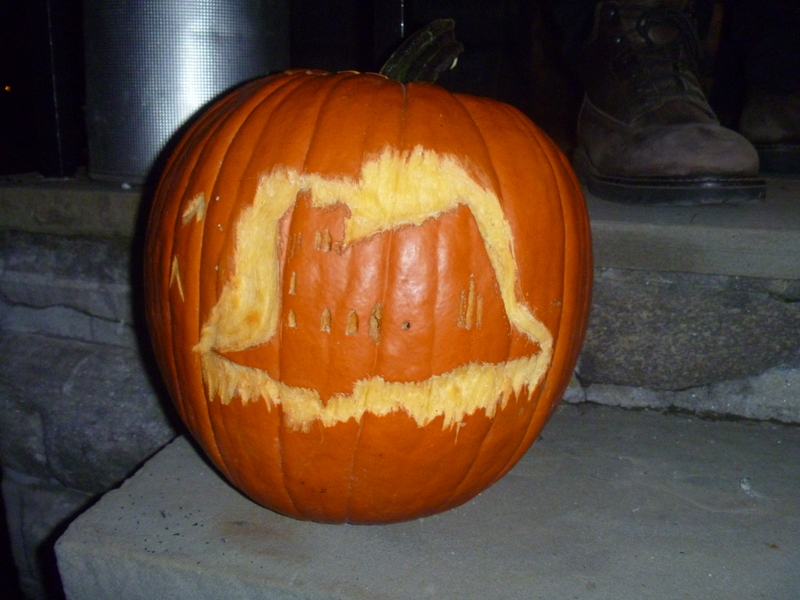 Carl Keyser did this. It rocked, yes! 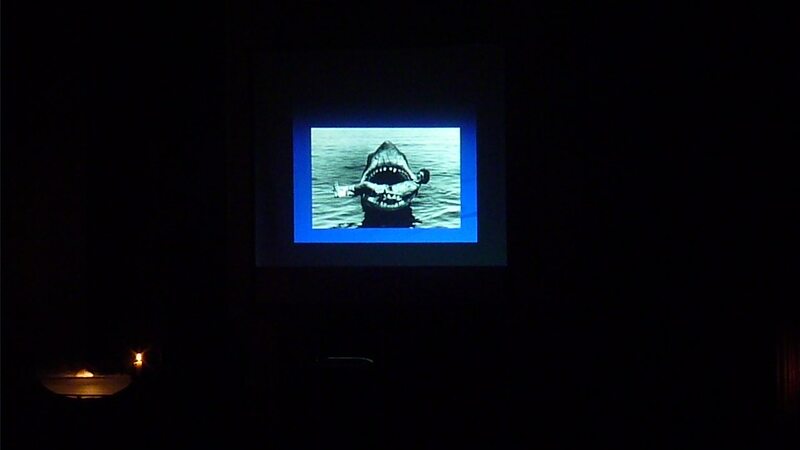 Nathan's second biggest fear: Sharks. His first? Trolls. Good friends Michele Ingram (left) and Maureen McFarlane (who does all my headshots) joined us for the night! 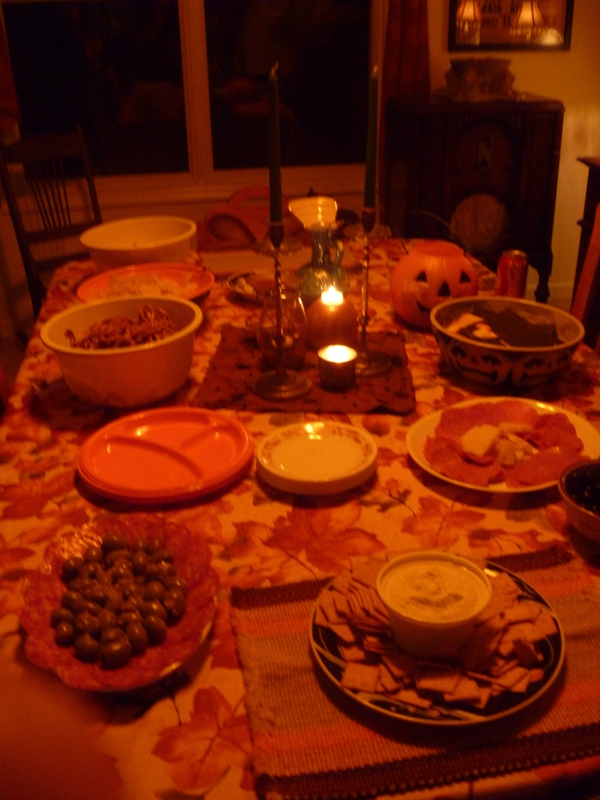 The spread back at my house. It had been a long day and we were all starving. 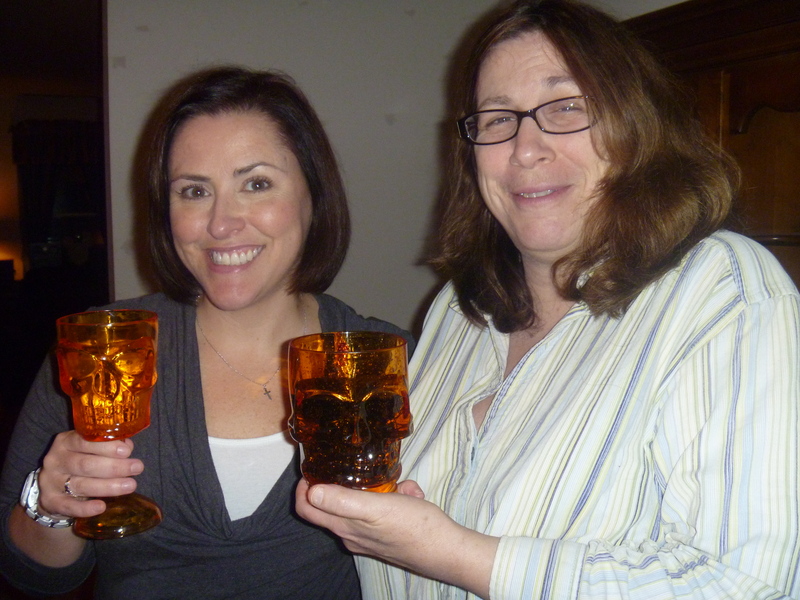 Maureen and Michele drink from matching Halloween glasses. Festive! 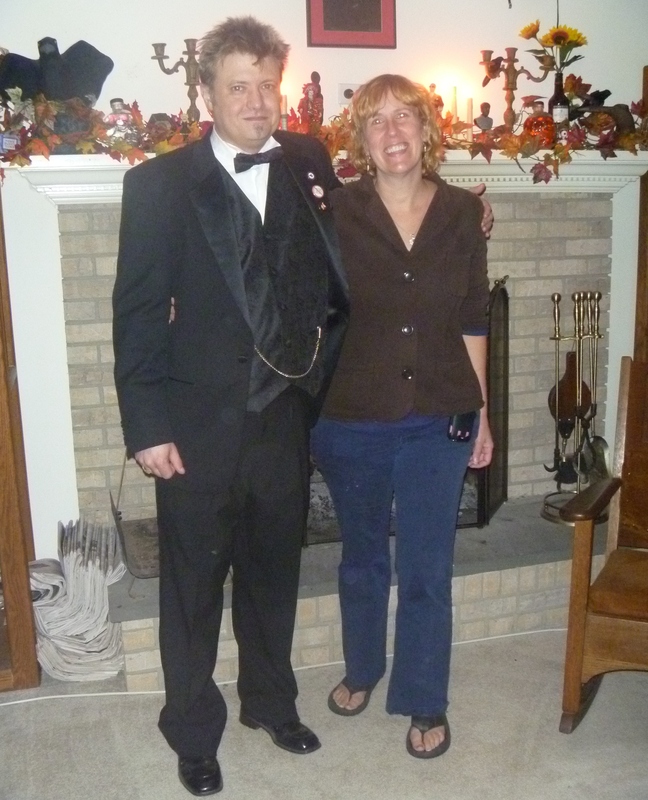 Nathan and Stacey in front of our Halloween mantel. 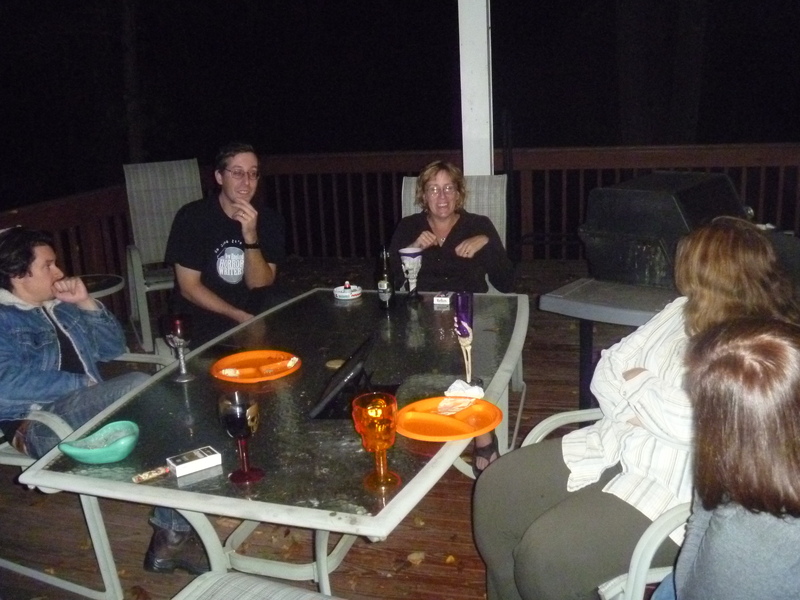 Chilling out on the back porch. It had been a hot day, and I'd been running around so much that, when the night set in, it was refreshing to sit outside. 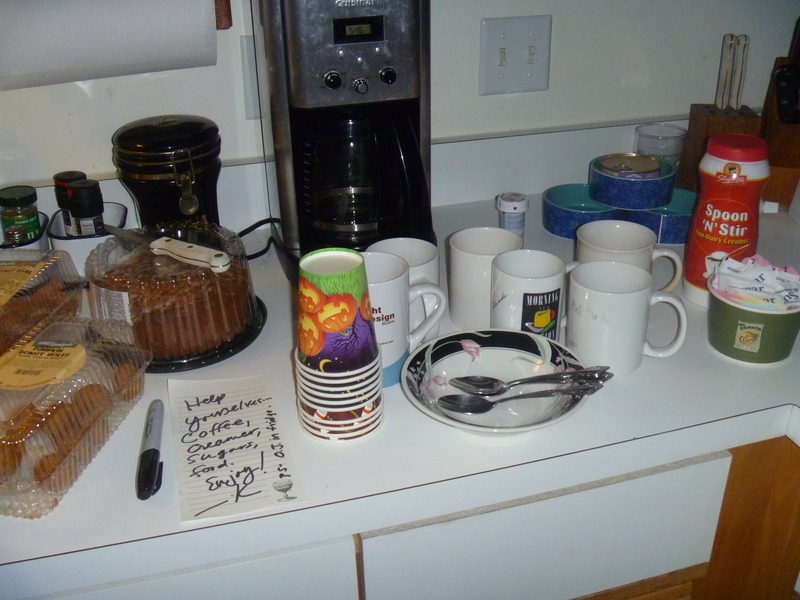 I cleaned up the kitchen and set up coffee for the next morning. I didn't hit the sack until 5:30 a.m. Sunday.